Grandma and narrator Anna are planning a wonderful surprise for Dad's birthday. 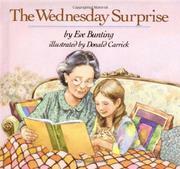 While Mom works late on Wednesdays, Grandma comes over with a mysterious, heavy sack so that they can work together. Dad, who drives a track, comes home just in time for the big day, bringing gifts for his family--a smooth pebble from the desert for Anna's rock collection, a bunch of wild flowers he picked for Mom. These simple gifts are received with real appreciation, but the best is yet to come: Anna, who at seven has just learned to read, has also taught Grandma to read well enough so that she reads The Velveteen Rabbit aloud after the birthday cake. Bunting includes just the right details to bring this nice family to three-dimensional life. Carrick provides well-individualized, affectionate visual interpretations of the characters and a familiar-looking, unpretentious but cozy home in his familiar watercolor style. A heartwarming, inspiring story; readers may well find that when his mother's accomplishment brings tears of joy to Dad's eyes, there are tears in theirs as well.